Part of the learning process is taking experience you already have and adapting it to something new. That is Gragson’s plan this weekend. The 18-year-old rookie has quite a bit of experience on road courses, so he intends to use that knowledge and apply it to Martinsville. On the surface, it may sound like a strange plan, but really the similarities are there. Road courses have long straightaways and tight turns, which is how Martinsville earned its nickname “The Paperclip.” Sure, there are no right-hand turns this weekend, but it makes sense to Gragson and his veteran crew chief Marcus Richmond. Richmond is no rookie at Martinsville. In fact, he has two wins as a crew chief in the NASCAR Camping World Truck Series there. His first victory came with Dennis Setzer in 2008 and he claimed another win with Kevin Harvick in 2012. In 19 starts, Richmond’s truck teams have two wins, four top-five, 11 top-10 finishes and led 456 laps. Last fall, Richmond earned his most recent top 10 at Martinsville with another young driver, Cole Custer. From what you have heard, is Martinsville anything like any other short track where you have raced before? If you won the grandfather clock where would you keep it? What have you done to keep busy during the month-long break since the last truck race? What is the key to getting around Martinsville? How tough is it to keep a rookie patient at a track like Martinsville where it’s so difficult to pass? KBM-007: The No. 18 Switch team will race KBM-007, for Saturday’s Alpha Energy Solutions 250 at Martinsville Speedway. Christopher Bell most recently finished fourth with this Tundra at Martinsville last fall. This chassis has three wins at Martinsville with Darrell Wallace Jr., (2013 & 2014) and Denny Hamlin (2011). 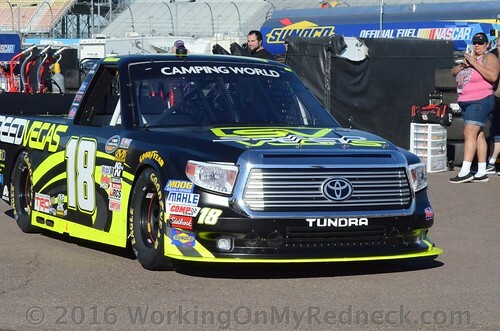 Has earned one top-15 finish in two starts this season in the NASCAR Camping World Truck Series. After an early spin, Gragson recovered to finish 14th at Atlanta Motor Speedway. Marcus Richmond has collected nine wins, 11 poles, 52 top-five and 107 top-10 finishes across 222 races in his 11 seasons as a crew chief in the Truck Series. 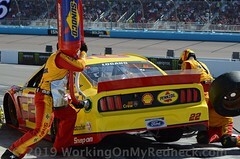 The veteran crew chief has been to victory lane with five different drivers (Ty Dillon, Kevin Harvick, Timothy Peters, Johnny Sauter and Dennis Setzer) and has recorded at least one win every year since 2012. The North Carolina native’s drivers have finished inside the top five in the Truck Series championship standings four times in the last five seasons, including a runner-up finish in the standings with Ty Dillon in 2012. His most recent stop was at JR Motorsports last season, where he guided Cole Custer to two poles, four top-five and 12 top-10 finishes over the last 16 races of 2016. Richmond joined KBM in December 2016 to coach rookie Noah Gragson in 2017. Richmond has two wins at Martinsville as a crew chief in the NCWTS. His first victory came with Dennis Setzer in 2008, followed by a trip to Victory Lane with Kevin Harvick in 2012.